Can you name more than one beneficiary to share and share alike? Yes, for the ordinary and post-retirement death benefits, you can name more than one beneficiary to receive your death benefit. If you name more than one beneficiary, each will share the benefit equally, unless you indicate specific percentages totaling 100 percent are to be paid (e.g., John Doe, 50 percent; Jane Doe, 25 percent; and Mary Doe, 25 percent). You can also name contingent beneficiaries, who would receive your death benefit only if all the primary beneficiaries die before you. Multiple contingent beneficiaries would also share the benefit equally, unless you indicate specific percentages are to be paid. When one of our retiree has passed away, after we receive a death certificate, we mail letters out to that individual’s beneficiaries to let them know if there are any benefits payable. Information about death benefits or beneficiaries cannot be given out over the phone or by email. If you believe that you may be a beneficiary, and you have your father’s Social Security number or registration number, you can email us using our secure form to provide us with your current address and phone number. You can also provide your contact information to us by contacting our Call Center at 1-866-805-0990, or writing to us at NYSLRS, 110 State Street, Albany, NY, 12244. In general, whether a beneficiary receives a death benefit from NYSLRS is determined by what tier and retirement plan our member was in. NYSLRS death benefits are determined by New York State law, and whether the member was in a union or not wouldn’t affect payment of these benefits. If the captain’s widow believes that a death benefit is due from either FCDSBA or CSEA, she would have to contact that union. If she believes she may be entitled to a death benefit from NYSLRS, she should email us using our secure email form, and a customer service representative will review the account and provide guidance. Filling out the secure form allows members to safely provide the information needed for us to assist them. Please allow five to seven business days for a response. When both husband & wife are retired from NYS, would the survivor be entitled to the larger pension? Your NYSLRS pension amount, and any amount to be paid to any beneficiaries, is based on the payment option you chose when you retired. For instance, under the Joint Allowance – Full option, a retiree would receive a reduced monthly amount for his or her lifetime, and if the retiree dies before his or her beneficiary, the same amount would continue to be paid to the beneficiary for life. If a retiree chooses a Joint Allowance – Half option and the retiree dies, the beneficiary receives half of the retiree’s amount. The option you chose when you retired, as well as a description of how that option works, should be listed on your Retiree Annual Statement. We mail the Retiree Annual Statements out every February. For a list of the options that were available to you when you retired, and how each of those options would affect your pension, please visit our Payment Options Descriptions page. 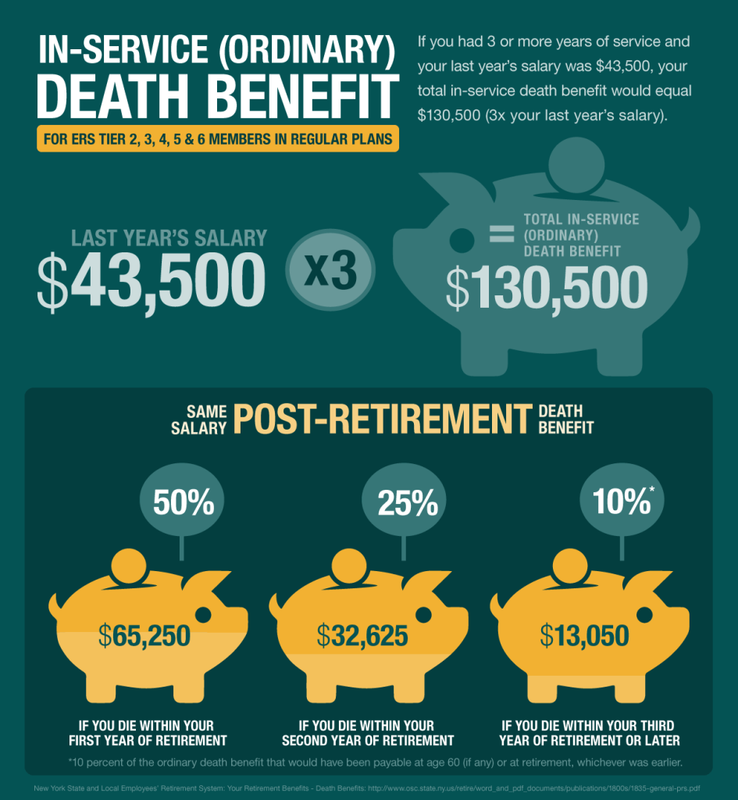 If you mean sign up for death benefits, most NYSLRS members are automatically covered by a death benefit, but the specific death benefits vary by tier and retirement plan. Your employer should be able to tell you which retirement plan you’re in. Then, you can check your plan booklet to find out which benefits you have. Plan booklets are available on our Publications page. You also can find your tier, plan and death benefit information on your Member Annual Statement (MAS), which we distribute every summer. If you have questions about your particular situation, we recommend emailing our customer service representatives using our secure email form. One of our representatives will review your account and respond to your questions. Filling out the secure form allows us to safely contact you about your personal account information.